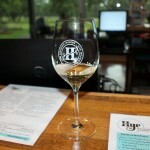 Memorial Day weekend came and it was time to visit some Texas wineries in a Fredericksburg road trip. We made plans to join forces again with Dave and Kelli Potter along with Laurie and Shelly Ware. A schedule was started as to what we wanted to see and it eventually evolved into a very busy Saturday. Part of the reason was because unfortunately Gloria had to work on Memorial Day (Monday) so we had to return home on Sunday, otherwise, we could have spread the wineries we needed to see over three days instead. We all met at our first stop for the day which was Lewis Wines. I had previously visited by myself and knew Gloria would like the wine in addition to the other couples. 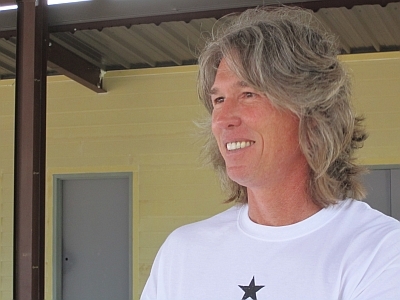 It wasn’t long before Doug Lewis got us all started with a tasting and co-owner Duncan McNabb soon arrived at the winery. As expected, everybody enjoyed the wines and the winery. 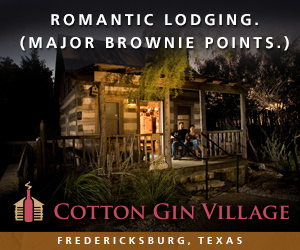 If you haven’t made an appointment for Lewis Wines yet, do it on your next visit to the Fredericksburg area. 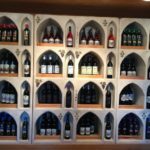 A new winery which will be opening soon, probably at the end of July, is Hye Meadow Winery and we all have been watching the process of building the winery on Facebook. 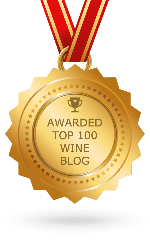 I have been fortunate to meet both the owner Mike Batek and winemaker Jeff Ivy at different TWGGA events and could not wait to finally visit the winery. Even though the winery is still being completed, Mike offered to show us around the winery. 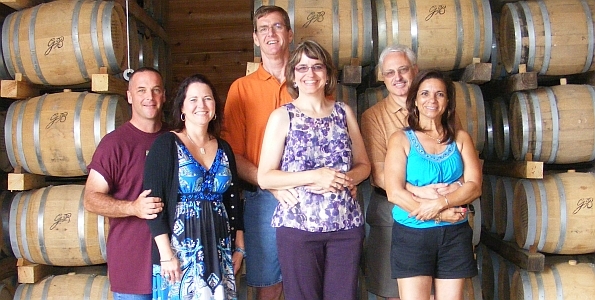 We met Mike and his wife Denise at the winery and they gave us a tour around the winery. There is still finishing up of the winery to do but I can already tell it is going to look very nice when complete. Mike showed us the tasting room building which is adjacent to the event center building, and we ended up at the production building in front which is going to hold a large amount of equipment and storage. To finish up our visit with Hye Meadow Winery we went to the Hye Market next door which offers wine, beer, and bourbon tastings in addition to a nice selection of food and beverages. Mike started a tasting for us and then Chris Black from Hye Meadow showed up to take over. 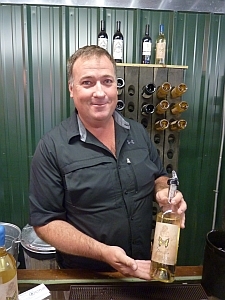 Also at Hye Market was Mark Watson, owner of Compass Rose Cellars, giving a tasting of his Papillon Pinot Grigio. 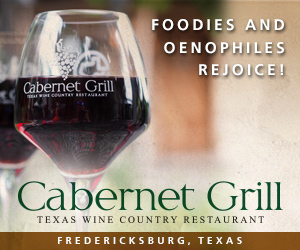 I know they make a Merlot too but since they also now do tastings at Taste Buds in Wimberley, perhaps that wine was there. The Pinot Grigio tasted good and I can’t wait for the winery to officially open, perhaps at the end of the summer. 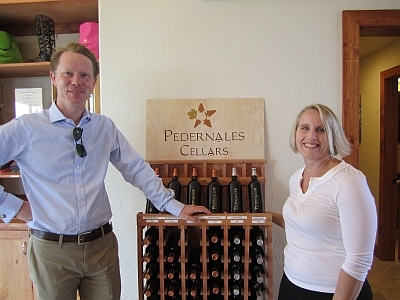 After Hye Market we headed to Pedernales Cellars. They had just released their 2012 Reserve Viognier which recently won a Grand Gold in the French Lyon International Wine Competition, so I had to make a quick stop to get a bottle of the wine before it was sold out. We were fortunate to meet co-owners Fredrik Osterberg and Julie Kuhlken who we had a nice conversation with, albeit too brief. 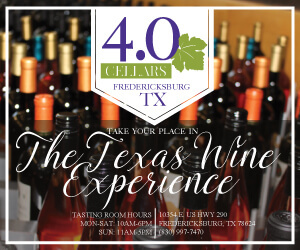 They told us Pedernales Cellars will be sponsoring a hospitality suite at TEXSOM this year so anybody who goes will get a chance to enjoy their wines plus some other Texas wineries in the suite. It was time for another quick stop at 4.0 Cellars because Brennan Vineyards had recently released their new version of the Dark Horse Nero d’Avola and their first Tempranillo. Fortunately the wines had made their way to 4.0 Cellars so it was nice to be able to stop and make a quick purchase. 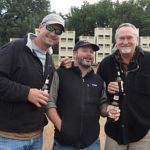 We had heard earlier this year about a new tasting room which was going to open up in Fredericksburg called Six Shooter Cellars. 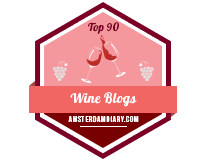 There is not a lot of information on the website and from what we read there would be six wineries participating in the tasting room, but we could not find the names of all six wineries. Fortunately the day we were driving down Highway 290 was their first day of opening and we found out when we stopped. 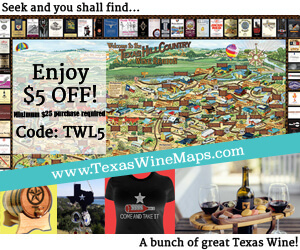 The six wineries which make up Six Shooter Cellars are Cross Timbers Winery, Yepez Vineyard, Retreat Hill Winery & Vineyard, Clear Creek Winery, Cowtown Winery, and a new winery in Lubbock called Blazing Barrels. We were greeted at the door and directed to the center tasting room which is surrounded by wood siding from a tobacco barn in Kentucky. We all started a tasting by selecting the wines we wanted to taste. Unfortunately there were no wines present yet from Retreat Hill and Blazing Barrels but we were told they would be arriving soon. 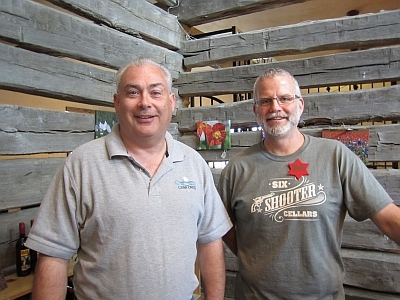 We then got a chance to meet David Skinner, owner of Clear Creek Winery, and Bob Besgrove, owner of Cowtown Winery. The western-themed winery looks like it will be a fun time and I will have more information in a future blog post. It was time to check in at the Lazy T Bed & Breakfast where we would be spending the weekend and we found it easily just south of Fredericksburg. 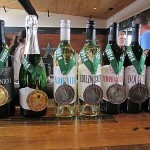 We quickly unloaded the cars because we had an appointment with winemaker Don Pullum of Sandstone Cellars at 4:00 pm. We jumped in our vehicles and headed to Mason. I had met winegrower Dan McLaughlin at a couple TWGGA events and since his Robert Clay Vineyards is also located in Mason, we invited him and his wife Jeanie to join us at Sandstone Cellars. After notifying Don Pullum we were going to be a little late, we arrived to find Dan McLaughlin already there enjoying a glass of wine with Don. 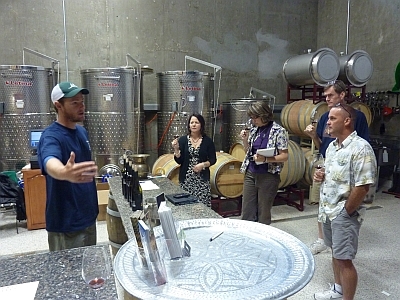 Introductions took place and Scott Haupert, co-owner of Sandstone Cellars, started a tasting with all of us. Jeanie McLaughlin soon arrived and joined in with the fun followed soon by Manny Silerio, co-owner of Sandstone Cellars. After a wonderful tasting, we were all hungry and conveniently went next door to Manny’s mother’s restaurant Santos Taqueria to eat. We all enjoyed the authentic Mexican food and the nice weather outside as we ate. 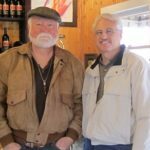 Now that our stomachs were satisfied, Don Pullum offered to take us to Pontotoc to see the location for his upcoming winery along with two other wineries. Pontotoc was a longer drive from Mason than I anticipated but the small town soon came into view with the vineyard beside the road. We pulled up to an old small strip center and after getting out of our vehicles, Don first brought us to the ruins of the San Fernando Academy which was behind us. Now instead of a building was a beautiful wildflower memorial garden for his wife. Back at the buildings, Don explained the buildings in order from left to right originally were a saddlery, barbershop, post office, and a movie theater. 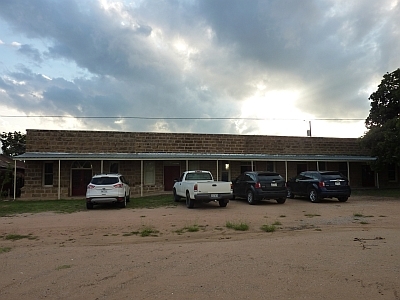 The buildings are being turned into the tasting room and production room for Pontotoc Vineyard, Dotson and Cervantes winery, Don’s Akashic Vineyards winery, and again the restored movie theater. Carl and Frances Money, owners of Pontotoc Vineyard, were unfortunately away due to family but Carl’s uncle Ronnie Money was there to help show us around. 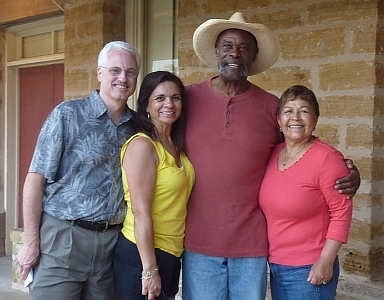 While touring the buildings, lo and behold Alphonse Dotson and Martha Cervantes pulled up. They happened to be driving home and just stopped by, so it was a pleasant surprise for all of us as they joined us for the rest of the evening. We ended up in the Pontotoc Vineyard production room with Don showing us how different grapes can be blended together to make the perfect wine. We tasted the different wines from the tanks and he showed how one wine could have a fast start and long finish, but had a gap in the middle. 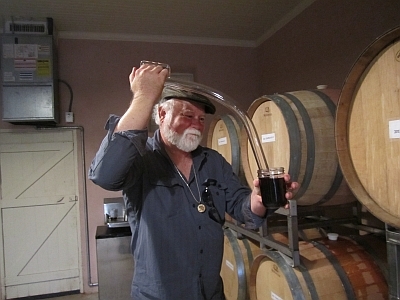 The job of the winemaker at that point is to fill in the gap so it becomes a balanced wine. At the end of tasting various wines, we got to the one which filled in that gap and was balanced. It was a very interesting demonstration. Ronnie showed us the homestead house and then as much of the vineyard as we could since it was dark at that point. It had been a wonderful visit to Pontotoc and we can’t wait to go back and visit in October when all three wineries are expected to be opened. We had a very productive, busy, but extremely fun day and it was now time to call it a night. Sunday morning arrived and we met KK Taylor of Lazy T Bed & Breakfast as she prepared a delicious French toast breakfast for us. One thing a few of us said we had to do was visit Garrison Brothers Distillery located in Hye. That was great to hear as Gloria and I had tried visiting a couple times in the past but never made it at the exact hour the tour was to start. We made sure we arrived 10 minutes in advance of our tour time and had no problems this time. We jumped on board the hayless hay ride which took us up the hill to the distillery. The tour of Garrison Brothers was very interesting starting from where the corn, wheat, and barley is brought in, moved to the fermentation room which in fact makes beer, and finally to the distillery house where the stills are used to cook the beer. Some interesting tidbits were that bourbon is a protected spirit meaning that it can only be made in the United States, much like Champagne can only be made in France. The whiskey coming out of the still is called White Dog and is clear in color. Bourbon gets its darker color from being in a barrel which can only be used once. We then got to the point where we could taste the bourbon. Even though it was 11:00 am, it was a great start to the day. 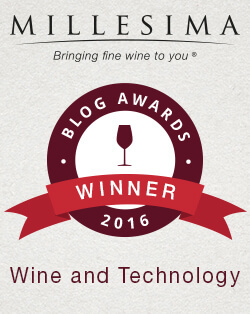 After tasting the Texas whiskey, it was time to get back to wine. 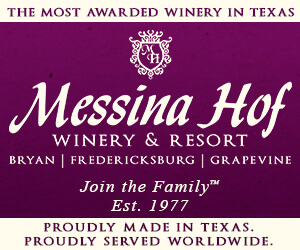 We had received an invitation to Messina Hof Hill Country so we headed there. We met general manager Dena Kasberg who had arranged a tasting bar just for our group. 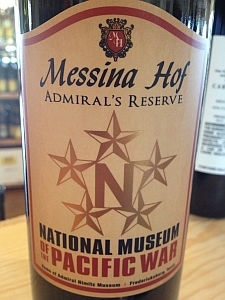 A great tasting was done and one wine which Gloria and I as VIP members of Messina Hof had not yet had was the Admiral’s Reserve whose proceeds go to the National Museum of the Pacific War. Dena said Paul V. Bonarrigo thinks the Admiral’s Reserve is his best Port yet, and we couldn’t disagree. Since my father served in World War II in the Pacific and has visited the museum, two bottles came home with us, one for him who we will be visiting this weekend in Florida and one for us to enjoy. Actually we may end up enjoying both of them, one there and one here, but it’s the thought that counts, isn’t it? 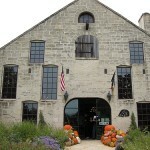 We all thanked Dena for the tasting and went to our next appointment which was at Hilmy Cellars. 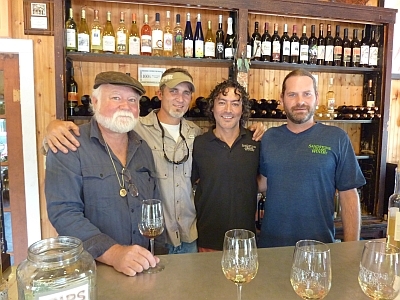 One of our favorite tasting guides is Vinny at Hilmy Cellars and we also wanted to meet Josh Fruland who works there. We arrived at Hilmy Cellars and met Josh outside. Upon entering the winery, we saw they had room for us set up at the table Vinny was working at. After meeting owners Neldie Gonzales and Erik Hilmy, Vinny started our tasting of the new wines which had recently been bottled. 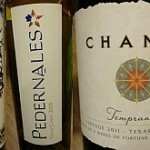 Even though they were young wines, they were already good and you could definitely taste the potential. Once again Hilmy Cellars, even though being a fairly new winery, surprised no one with excellent wine. We said our goodbyes and headed to the next winery, William Chris Vineyards. 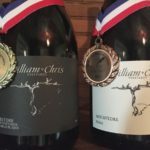 Anne showed us to a tasting room and we enjoyed a nice tasting of William Chris wines which is always great. We had not seen the new additional tasting room which had been built and was impressed by the room. There were a lot of people visiting the winery with five tour limos outside but the winery was able to handle the number of people with no problem. Great job! Unfortunately at this point it was time for Gloria and me to head home. The Potters and Wares went on to visit at least a couple more wineries that day. It had been a very busy, but very fun weekend, and we cannot wait to get together to do it again! Wow! What a weekend! Sounds like you had a great time. Thank you for coming to visit Messina Hof Hill Country. So glad you enjoyed the Admiral’s Reserve. Have fun in Florida. Thanks for keeping us up on these new wineres and places, and occasional picture of old friends is fun too!! 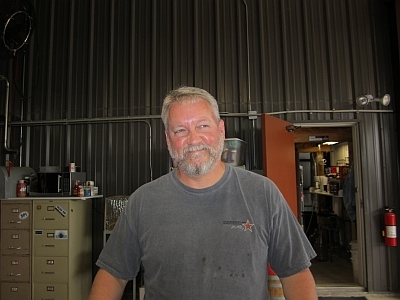 Neal Newsom Winegrower Plains Tx. You’re certainly welcome as it is definitely a fun journey!